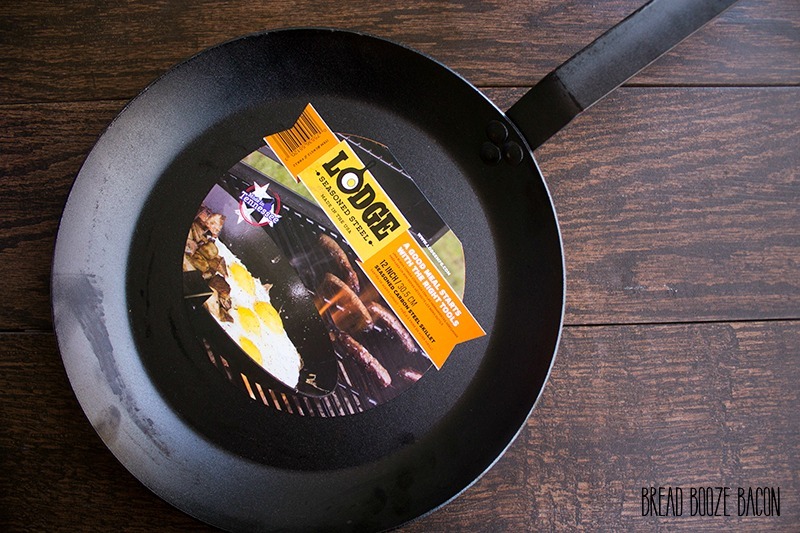 This post is sponsored by Lodge Cast Iron. All opinions are 100% my own. 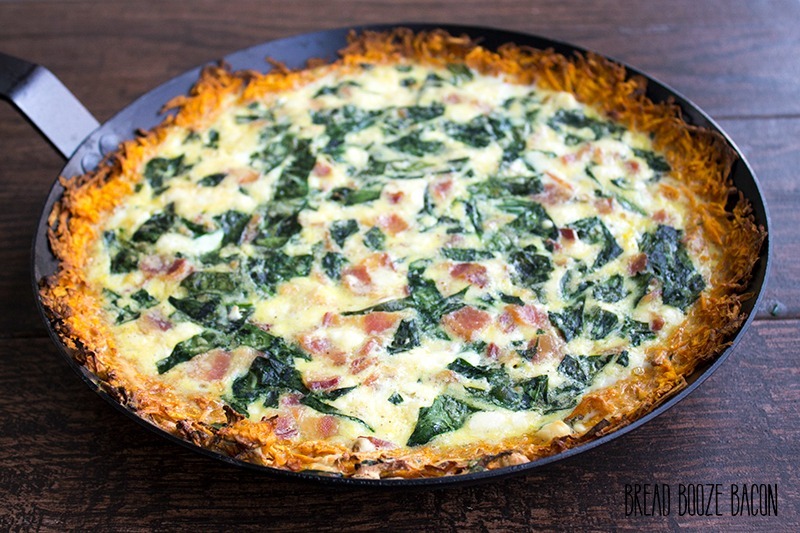 Spinach and Bacon Quiche with Sweet Potato Crust is a deliciously filling breakfast that’ll have everyone coming back for seconds! A big breakfast is a weekend occasion at my house. Weekday mornings are streamlined and the kids like to have dry cereal with a cup of milk. They’re weird like that. So when Saturday and Sunday roll around, we have pancakes, casseroles, and whatever else I’m in the mood to cook. And since we’re bacon freaks there’s almost always a plate of bacon to go alongside. 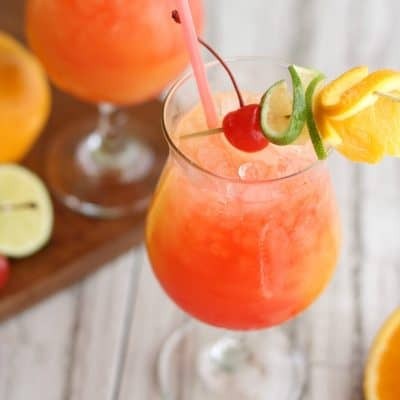 But this recipe mixes everything up in one delicious bite! And I’m totally addicted to it. I always have at least to slices and usually grab a cold slice out of the fridge later that day. This quiche is the bee’s knees kids! 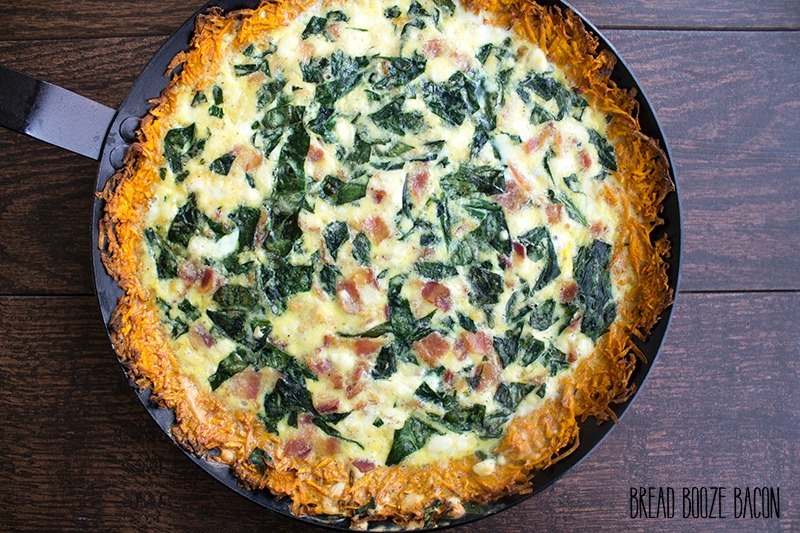 While I love pie crust like a mofo, I will sing the praises of a sweet potato crust all day long! 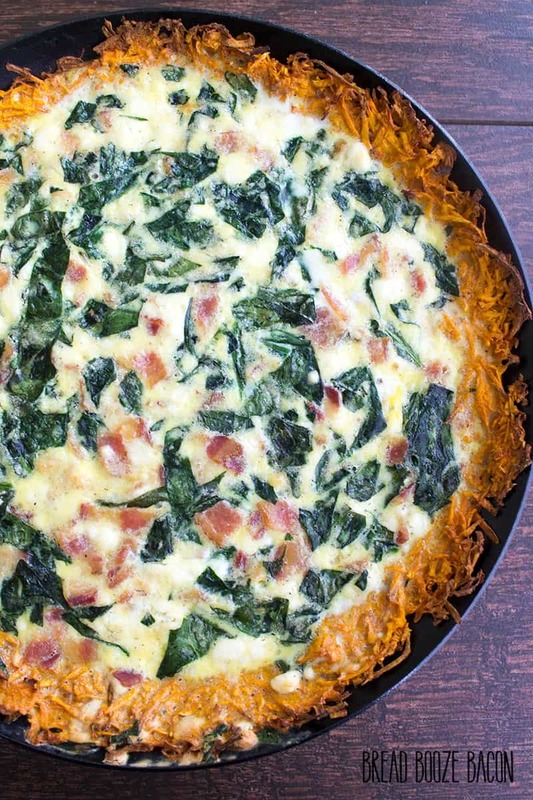 This quiche does take a little extra love (AKA time) but it is SO worth it! I may never make a quiche with a different crust again. Seriously. 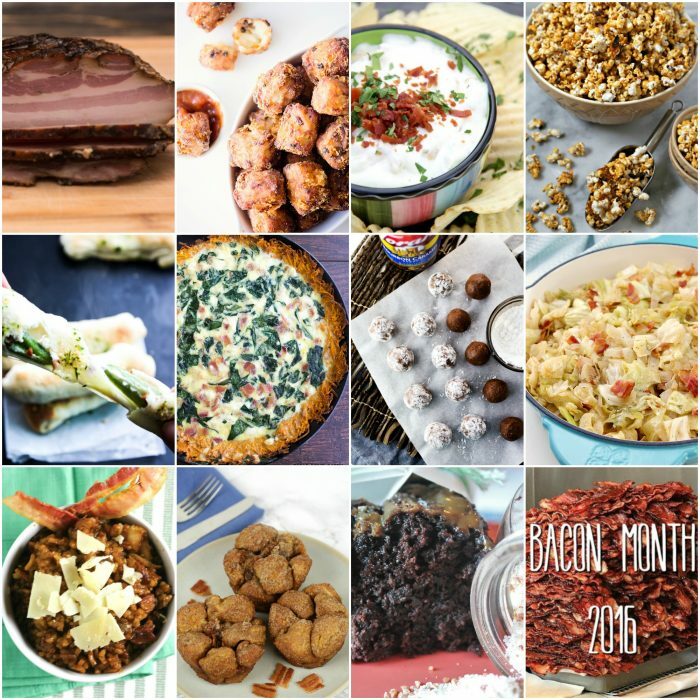 Mix and match the filling to your tastes and you’ll have a dish you want to eat morning, noon, and night! I also love this leek and goat cheese quiche variation from my aunt…it’s what got me started on this whole sweet potato crust kick! I love that this recipe is cooked and served in the same dish. Now I cooked the bacon separately, but if you wanted to keep this a one-dish quiche you could cook the bacon in the skillet, and then use some of the bacon fat to coat it. This does add extra time to the recipe so that’s totally your call. Since this Lodge Carbon Steel Skillet is brand new, and the potatoes kind of like to stick to anything the butter or bacon fat is a must. Then you just need to run a knife or cake server around the edge to release the potatoes and voila! Full disclosure, I totally forgot to add the milk before I poured the filling into the crust. So I had to take the filling out, stir in the milk, and then pour it back in. Everyone lived. 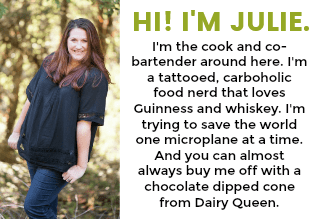 It’s like Julia said, “Always remember: If you’re alone in the kitchen and you drop the lamb, you can always just pick it up. Who’s going to know?” Not that I’d pick food up off the floor and keep going, but it totally works in this situation. 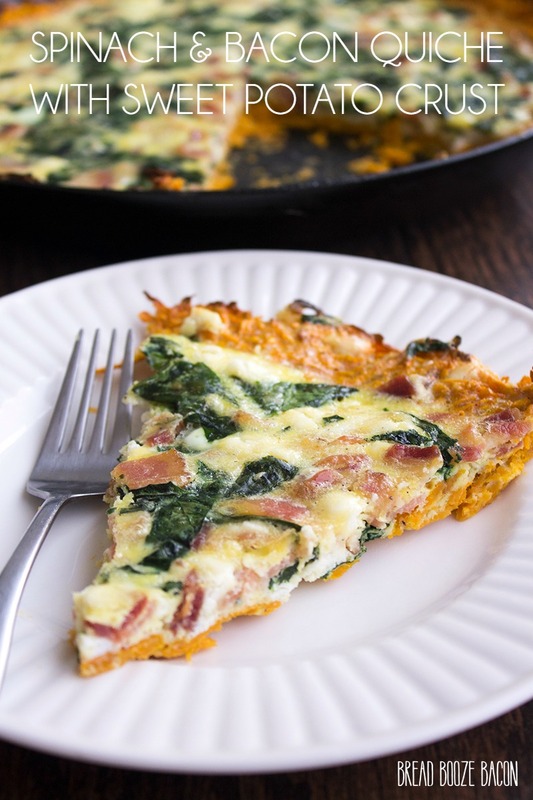 Spinach and Bacon Quiche with Sweet Potato Crust is a deliciously filling breakfast that'll have everyone coming back for seconds! Preheat your oven to 450 degrees F. Coat a cast iron skillet or springform pan with butter. If using a springform pan, cover the bottom with a piece of parchment paper. Grate the sweet potatoes with a box grater or the grater attachment of your food processor. Transfer the grated potato into a large mixing bowl. Use paper towels to squeeze the excess liquid from the potatoes. Add the egg, salt, and pepper to the potatoes. Stir until well combined. Pour the potatoes into your prepared pan. use your hands to press the potatoes up the sides of the pan and along the bottom to create a crust. Be sure to close any holes that may appear while moving around the potatoes. Bake for 30 minutes. The top edges of the crust will brown and the rest of the crust will crisp up. Carefully remove the pan from the oven and allow to stir for 5-10 minutes. While the crust sets, heat a skillet over medium-high heat. Cook the bacon until crispy. Remove to a paper towel-lined plate. Place the spinach in the hot bacon fat for 1 minute, just enough to wilt it a bit. Remove the spinach from the fat. In a large mixing bowl, whisk together the eggs and milk. Add the spinach, bacon, and goat cheese to the egg mixture. Stir to combine. Bake the quiche for 30 minutes. Carefully remove from the oven, and let the quiche set for 10 to 20 minutes. Do you know the calories of this dish ? Great question Aisha I just updated the recipe card with the nutritional information for this recipe. There are 243 calories per slice.